Mediaweek deputy editor Kruti Joshi rounds up last nights TV ratings. The channel had another strong night thanks to The Block. 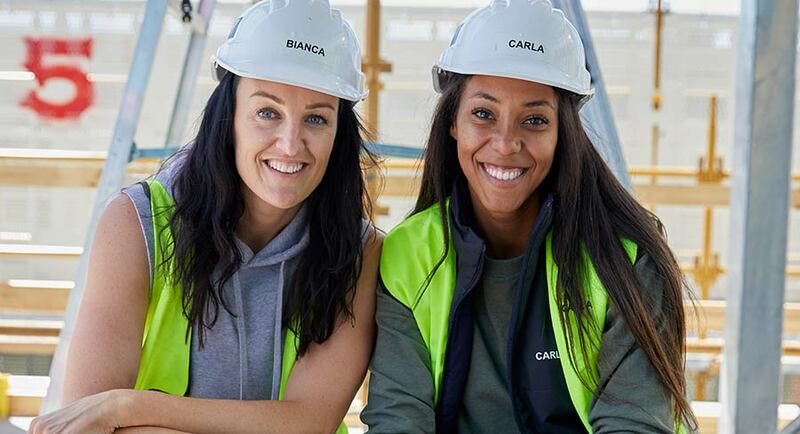 It was kitchen week on the renovating reality show, but what has been dubbed as Norm and Jess’s poolgate debacle continued to take up screen time. The five teams got together to make a decision on whether Norm and Jess should be allowed to get a pool or not. Initially, the decision largely fell on their downstairs neighbours Courtney and Hans as additional beams would have needed to be installed in their space to support the weight of the pool above. However, they decided against it and eventually told the rest of The Block contestants. A body corporate meeting was held and the verdict was a no. This episode of The Block was watched by 1.046 million. A good lead-in audience of 845,000 watching A Current Affair supported it. The current affairs show further investigated the mysterious disappearance of Lynette Dawson in 1982. It spoke to the schoolgirl that Dawson’s husband Chris was having an affair with, Joanne Curtis. Later in the night, Australian drama Doctor Doctor had 631,000 watching. Seven News was the most-watched program on free-to-air TV last night with an audience 1.110 million. It was well ahead of its competitor on Nine. The news was the network’s only program inside the top 10. However, Home and Away, Little Big Shots and The Chase Australia easily secured a spot inside the top 20. There was some sibling rivalry on display on last night’s episode of Little Big Shots. Twins Elias and Zion showed off their impressive classical piano skills to an audience of 605,000. It was a good night for Working Dog’s Have You Been Paying Attention? 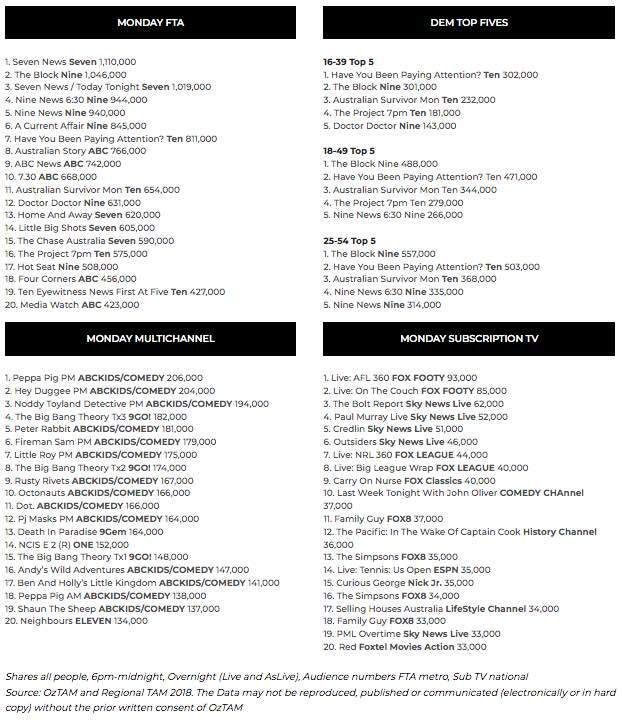 with the program being the seventh most-watched show on TV on Monday night. 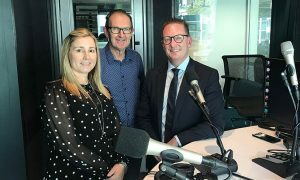 An audience of 811,000 welcomed first-timer Gen Fricker on the show. Fricker is a stand-up comedian and a presenter on triple j. Evicted 2018 Survivor contestant and five-time Olympian Lydia Lassila and Diamonds captain Caitlin Bassett were the guest quiz masters on last night’s episode. Australian Survivor just missed a spot in the top 10. It ranked #11 with 654,000 tuning in. The broadcaster had three shows inside the top 10 last night. Australian Story was its best performer at #7. The 32-year-old Lynette Dawson case keeps on giving. The Australian Story episode was called The Teacher’s Wife and took a look behind the making of popular News Corp podcast The Teacher’s Pet. It featured the journalist behind the series, Hedley Thomas. Mediaweek interviewed Thomas in the early days of the podcast series. He said: “This case is a stain on the NSW justice system.” Read the full interview here. 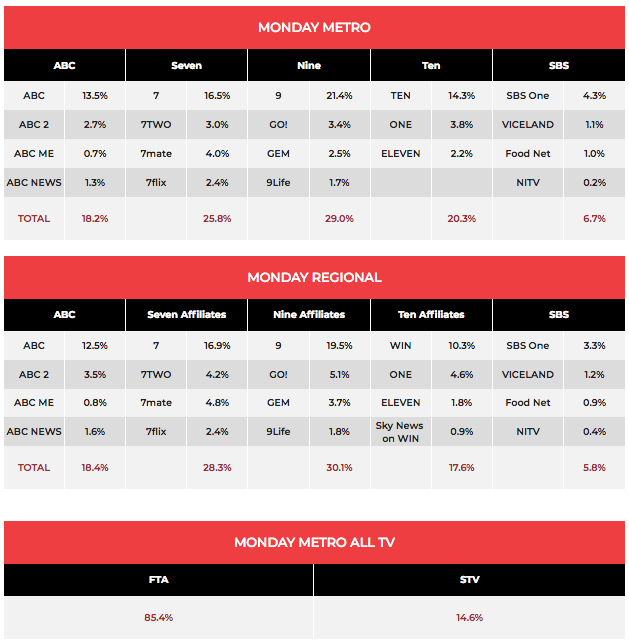 The other two ABC shows inside the top 10 were ABC News and 7.30 with 742,000 and 668,000 viewers respectively.